Touchstone Crystal Review: Unique Business Opportunity? Last updated on October 22, 2018 By Nat Leave a Comment This post may contain affiliate links. We appreciate you supporting Rags To Niches! Full disclosure here. In my Touchstone Crystal review today, I will be asking whether this is a worthwhile business opportunity. Touchstone Crystal are a unique multi-level-marketing company that only just started back in 2009. They’re unique in the fact that they’re founded by the highly reputable and well-established Swarovski brand. I’m a fan of Swarovski myself, so I know they produce decent quality products. However, Touchstone Crystal are a multi-level-marketing business and many MLM’s have a bad reputation because to grow your business, it relies on you recruiting others. Useful post: The difference between an MLM and a pyramid scheme. So, you will be selling jewellery directly initially, generally through setting up home parties. You will also be encouraged to grow your business by recruiting others to become Touchstone Crystal representatives. You will then earn a percentage of what your recruits make. Therefore, you will be relying on your recruits making good sales too, as well as recruiting others themselves, in order to successfully grow your business. If you’re not keen on recruiting others, you can just directly sell jewellery and ignore the multi-level-marketing aspect…. But, in the majority of cases, that would result in a part-time income, rather than a substantial one. Do you make a full time income, simply directly selling with Touchstone Crystal? Go ahead an leave me a comment below! In order to get started, you’ll need to purchase one of their starter kits – which are actually not too expensive. So, if joining the business is something you’re feeling a little unsure of, at least you can try it relatively inexpensively. You can see the details of these kits below – you also have the option of having your own website. Basic Starter Kit – $139. Includes 8 Jewels. Enhanced Kit – $299. Includes 13 Jewels and business tools. On average, Touchstone Crystal claim that their consultants make $200 per home party. So, you could pull in $800 a month, if you could manage to set up four parties per month. Of course, this figure will depend on many things, including the size of your party. Touchstone Crystal do seem to have some appealing perks and incentives too, such as a discount on their jewellery, trips away for you, potential BMW car allowance and a trip to Austria among them. Commission on jewellery starts at 25% and goes as high as 40%, which is generous and you can also make an additional 9% of your recruits sales. It’s generally thought that there has to be a significant mark up on products that are sold through MLM businesses, in order to cover costs. This leads many to feel that MLM products are always going to be overpriced for what they are. However, even in that case, it doesn’t necessarily mean you can’t do well selling the products. If people perceive items to be high value, or worth the price tag, people still will buy. In the case of Touchstone Crystal, while some of the products seem on the pricier side, they weren’t shockingly so. There was also plenty that would suit lower budgets. They even have an under $50 section. Although, those mainly included earrings when I searched through. The reality of having a Multi-level-marketing business, is generally worlds away from the glamorous way that it is regularly portrayed. It’s not a business for everyone and notoriously, MLM’s have a terrible failure rate. But it will certainly help you to get ahead, if you have a passion for the products you’re selling. If you look on YouTube for reviews of various MLM businesses, the people who become successful are so often – fantastic sales people. That’s not a coincidence of course, you really need that enthusiasm and passion to come through when you speak to potential customers. If you’re a superb communicator and enjoy connecting with new people, socialising and hosting parties, you will find it far more enjoyable. I’d love to hear about any experience you’ve had with Touchstone Crystal – let me know below in the comments! How big is your social circle? You cannot just throw a couple of parties and then forget it, you’ll need to be consistent week in and week out. If you want to keep your Touchstone Crystal business alive, (and you don’t want to recruit) most people will attempt to throw home parties. (There is also the option of throwing a social media parties, which are a good idea if you get to grips with social media, or generate a large social media following). But, a majority of people struggle to set up enough home parties, once their initial contacts have all dried up. I have seen many individuals fail, because they just didn’t have the contacts and the relentless hustle became too much. Throwing a party with friends is one thing – but trying to entertain and sell to a bunch of strangers, is quite something else. However, it could be done if you think outside the box. For example, you could post flyers and business cards with your details, advertise locally, or network with parents at your kids schools, for example. Also, you could offer to come along to other peoples parties and gatherings, which would save you time and money having to set up parties yourself. Not expensive to get started. To really grow your business would mean recruiting others into the business and that’s going to be the challenge for many – especially with the high failure rate. Home parties are difficult to set up, once your initial contacts have dried up. Hosting home parties can become incredibly draining for many. Many people are just not suited to the direct selling aspect. People may resort to hassling friends and family and this can lead to strained relationships. As with any MLM, you are tied to this particular business and your success depends on it surviving, as well as your own recruits being successful. If you’re just interested in joining this business to do the odd home party, get discounted jewellery and make a bit of cash on the side, then it might be a good fit for you. However, growing your business by recruiting others into it is considerably harder and due to the high drop out rate, you’d always need to be on the hustle to bring more people in. While joining an MLM may have the appearance of running your own independent business – is partaking in an MLM really like that? This isn’t truly your business, because you’re still tied down to one company that’s not your own. Your success depends solely on their survival and success as a business, it will also depend on your recruits being successful. If your recruits fail, you lose money and if the business folds, you lose your entire business. When you’re part of an MLM, you are not in control of many factors. If you’re passionate about Jewellery, or even if you’re passionate about Swarovski – you could still sell their jewellery without being tied down to an MLM, by selling Jewellery as an affiliate. Related post – How to make your first affiliate sale online. The difference being, it would involve zero direct selling, no home parties and you wouldn’t be tied to one company. You could promote any jewellery that you like, that has an affiliate program attached. For example; take Amazon. 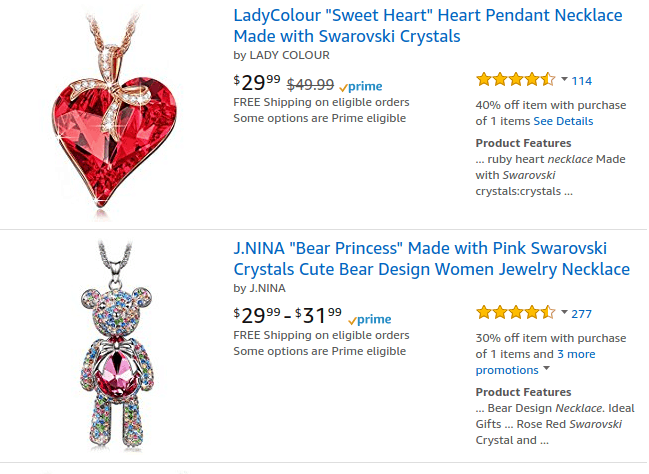 Amazon has one of the largest affiliate programs in the world and holds and unlimited amount of jewellery that you could promote, including Swarovski. Amazon also has the added benefit of showing reviews, so if you promote products with brilliant reviews, this is going to help your customer make a decision. There are also ways you can direct people to their correct Amazon store, depending on their location and make sales from all over the world. Touchstone Crystal Review: Final Thoughts! I do feel that there is a decent demand for this jewellery and if you’re prepared to work hard, you could make a reasonable income selling it- but you will be far more successful if you market yourself online too. For example; by setting up social media parties, or creating YouTube videos and social media profiles/fan pages. It’d also be wise to get some internet marketing knowledge and learn how to set up your own website. You could blog about your business and generate more leads for your business that way, as well as promoting a range of products. If you want to learn how to set up a blog and start building an additional income with it, this is a great place to learn. By having your own website, you can create a business that YOU control… and you can promote anything you like from there. If you have any experience with Touchstone Crystal, or have any other questions, leave me a comment below!